Conservative entertainment provacateur Phelim Mc Aleer held the World Premiere of his 2015 play "Ferguson the Play" in New York City . The drama depicts the shooting of Michael Brown by a greater St. Louis police officer in 2014 which sparked several days of rioting. This ugly incident which galvanized the Black Lives Matter movement under the ersatz slogan "Hands up, don't shoot." Mc Aleer wrote the play because he believed that the truth that it was a defensive shooting was not getting out because of media bias buying into a progressive activist agenda. 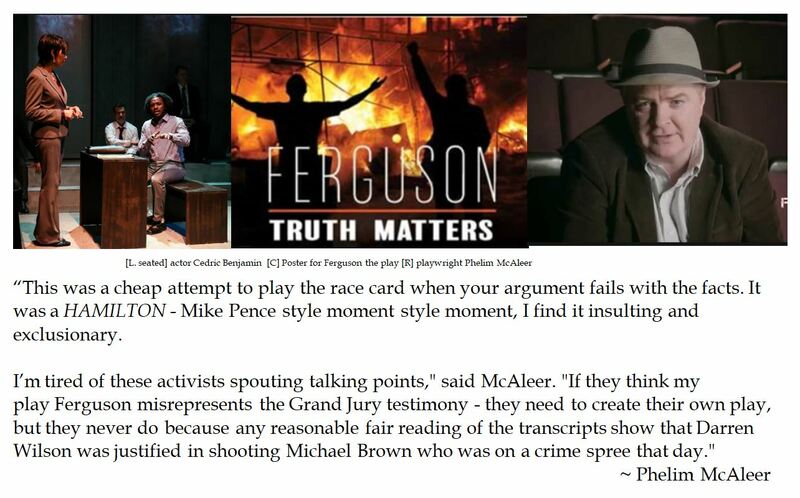 What made Ferguson the play notable is that playwright McAleer constructed the verbatum theater completely using the released transcript of the Ferguson Grand Jury. McAleer and director Jerry Dixon worked with a multi-racial cast to put on the controversial courtroom drama for a short run at the 30th Street Playhouse in Manhattan. On the closing night, Cedric Benjamin commadeered the stage at the close to voice his displeasure as he thought that the play was unbalanced and biased. Director Jerry Dixon shut down the rogue actor's rant, but the histrionic polemic spilled out into the street, with actor Benjamin accusing playwright Mc Aleer of "white arrogance". Mc Aleer later praised the director for shutting down the unscripted lecture by a cast member. It seems ironic that the actor invoked arrogance against the playwright, who raised over $51,000 in a crowdfunding campaign to mount the production, when the actor could not just say his lines. Mc Aleer deliberately brought Ferguson the play to New York after the cast of Hamilton accosted attendee then Vice President Elect Mike Pence to defy the conceit that conservatives are not welcomed in the New York theater community. On the first production, which was a stage reading in 2015, nine members of the Los Angeles cast walked off, with one actor claiming that he did not trust Mc Aleer's motives. At least those thespians were professional enough to disassociate themselves with a theatrical vehicle with which they could not agree. Ironically, Cedric Benjamin's grand gesture might prove to be counterproductive. It has drawn more attention to a small production, thrusting it into the news. Phelim Mc Aleer continues to fund raise over the controversy with an expressed purpose of continuing to perform Ferguson the Play in New York. Mc Aleer took great consolation that one BLM attendee who attended the play and left shocked and mystified that "Hands Up, Don't Shoot" was a lie. Pollster George Barna recently sought to understand why evangelical Christians supported Donald Trump, who seemed to contradict many of their mores. A large part of the answer is that SAGE-cons (Spiritually Aware Governmentally Engaged) conservatives have great distrust in the mainstream (a.ka. lamestream) media because of biased reporting against Trump that they now use alternate media sources to avoid "fake news". By banding together on core issues like rule of law, Barna contends that this 11% sliver of of the American electorate voting for Donald Trump was "The Day Christians Change America" (2017). The strength of SAGE-cons influencing America was shown more than for Election 2016. The informal boycotts by football fans of the NFL as they tolerate players who Take A Knee during the National Anthem has severely cut into attendance along with television ratings and is influencing advertisers like Papa John's Pizza to pull back. Such a motivated minority of SAGE-cons may well see Ferguson the Play as a chance to actuate their ideas and counter the "fake news" phenomenon in entertainment as well as cultural conceits.